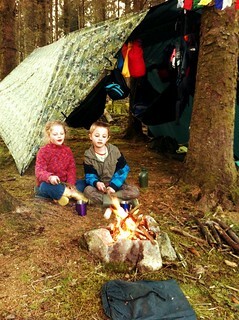 As a child growing up I remember the wonder and magic of camping and campcraft. I went to Cubs and Scouts and was always eager to learn more about living wild. I used to watch Les hiddins while tucked up in bed, long after my mum commanded lights out. As a teenager my friends and I spent most weekends camping down the marsh or cycling up to the Forest of Bowland to spend a few days away from it all. Now, as a father of two energetic kids and still having a keen interest in outdoor living, it seems fitting not only to take my kids out with me camping but also to pass on the skills and knowledge I've accumulated over the years. 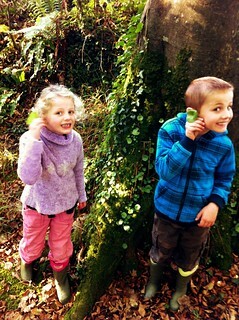 They are 6 and 7 and they both have a fantastic knowledge of hedgerow plants, both edible and poisonous. They can ID most trees found in the woods we frequent and their fascination and knowledge of birds, beasts and insects knows no bounds. Sometimes they educate me! They love camping and the outdoors, and are very active. They both go to kickboxing club, love to bodyboard (surfin soon :D ) and are keen explorers and adventurers of the rugged Cornish coast. I must add, that none of this has been forced upon them. They love being outdoors and their minds are like sponges, if they ask, I tell. If I don't know something they ask about, I look it up, and so I have learned too. I've been considering for a while now introducing them to knife craft and it kind of ran away with me when our very own Jakob gifted them their first knives a few weeks back. He very kindly gave them a Mora/LMF FireKnife each! So the next chance we had to get out, I set about teaching them the basics and of course the safety of knife handling. I thought the best way was to keep it structured but fun. For this I took inspiration from the knife basics videos that Ashley shot with Justin Telford that can be found here on Natural Bushcraft. 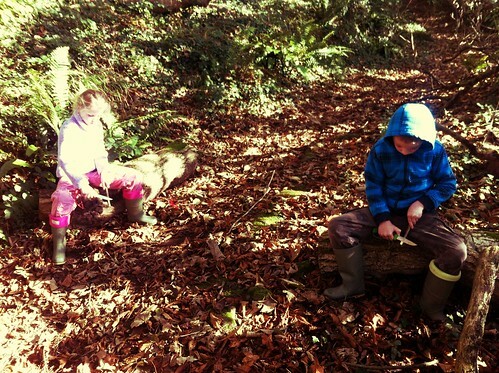 After finishing the whittlin session the kids wanted to get on with making a small fire, so we spent half an hour foraging dry standing wood and prepping it all. I let them get on with the prepping, again giving them tips. 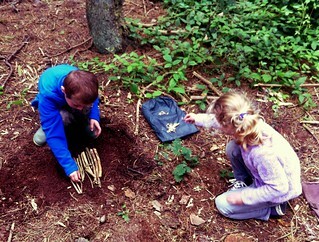 Corey made up the base of sticks while Erin snapped up all the fine sticks. Then we chatted about the fire triangle while we got it going and I showed them how easy it is to choke the fire and how best to lay the sticks. They absorped it and loved the trust I put in them to get on and do it. Knives and Fire! 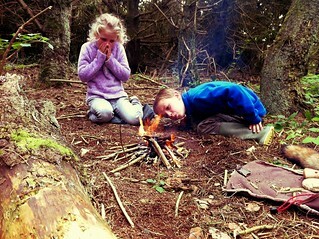 Most parents would die if they saw what things we (Bushcraft Folk) allow our kids to play with! This weekend we spent a few hours in a wood thats within walking distance of my place and the kids had loads of fun, mainly because, I left them to it. 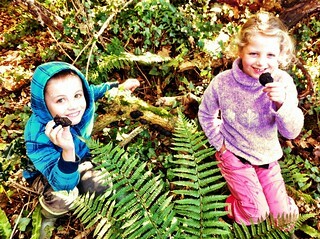 Rather than point things out to them all the time, I let them educate me as to the wild goodies to be found. We then found a nice spot with the dappled light filtering through a patch of Alder, remarkably close to where Ashley, Joe and I stumbled upon some Pignut earlier this year, and settled down for a spot of whittlin. They were so excited bless them, but once the knives were unsheathed and in use, their excitement turned to focused concentration as the making of marshmallow sticks commenced. It certainly was a proud moment for me, I hardly gave any input, just the odd adjustment to the angle of the cuts to make it easier for them. They both gave the utmost attention to the safe use of their new tools and I didn't once have to correct them on this. 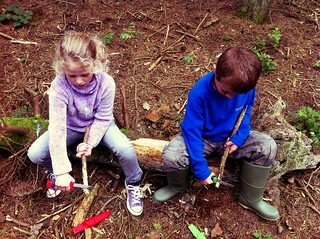 Also the look of pride on their faces on completion of the Pointy Sticks was a heartwarming moment. As a finishing treat, Corey wanted to have a go on the firesteel that is located within the knife handle, so I cracked open a cramp ball and demonstrated to him how its done, then let him get on with it. He didn't get it lit, purely because these freshly harvested balls were slightly damp and need drying out. He got some good sparks though and I was impressed with his control of drawing the steel rather than pushing with the knife. So with a grin on my face and pride in my heart, we packed up and strolled back home. I really am astounded as to how well they've both taken to handling a knife with relative ease. They still have a lot to learn and make no mistakes, I'm sure there is going to be accidents along the way, but thats's where it's handy having an ex RAMC Medic as a dad ;) So the next few trips out, we'll do more practice with the straight arm cut and maybe soon do some push cutting with the next project, making daddy some pegs! A massive thankyou goes out to JEEP (Jakob) for his kindness, they won't ever forget their first knives and the first time they used them. Also a big thankyou to Ashley and Justin for making the videos that inspired my teaching methods. And also thankyou to everyone reading this, I hope that it helps you in Passing On your well earned skills too. I loved this. 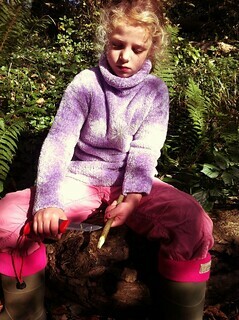 I really believe that the skills you are teaching may one day be essential to survival. Handling animals for work and food next!!! Parenting ... you are doing it right !!! Ahhh man, this takes me back to when my Dad gave me my first knife. I still have it actually. Just a non-branded swiss army knife. I whittled with that thing until it went blunt, and ended up stealing a Stanley knife from his tool box... and proceeded to cut myself. Karma? Maybe haha... this is a great piece about passing on knife skills. Looks like you've got them well set up so that they don't cut themselves. Excellent! 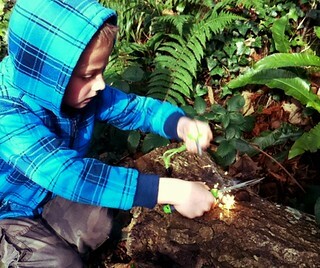 Great read, it's a real decision when to give the little ones their first knife. Mine came at age six, down in Beaulieu in Hampshire, now, down on Dartmoor, I'm rarely without it in my pocket. we teach our scouts knife work and have a system where we teach them how to make an item with their knives and then they make them. they have to make these little projects solo to earn rewards, its a good way to keep their ambition from overtaking their skill causing accidents. they make a peg, then a pothangar, a birch bark matchbox, a walking stick and finally a 3d scout logo which requires good dexterity and knife control. I hope the three of you have many more adventures ahead of you. Phil, you wrote words but i heard music. I am teaching franks junior exactly the same and yes, she loves it. 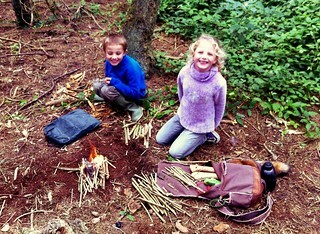 I have long argued bushcraft, (read life), skills should be taught in school. More of the same please Sir ! Thankyou everyone for the kind words, I'm truly grateful. @Hippohead, Dude, theym were great days. Allowed? Haha! Hangmans Wood we practically lived there for half a year! Hope you're well Bud. I do indeed remember us camping or getting out as much as we could (or were allowed). 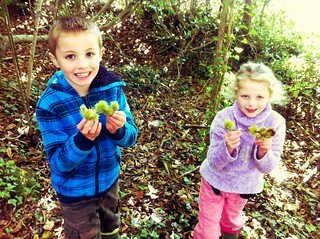 The little'uns look to be having a great time in all the photos - keep up the good work!! My kids are now 20 ,22 and 24 And Im getting "Hey Dad you remember when we went camping?" Or "hey Dad Ive just found my old pellet bag! Remember when we used to go get the Bunnys out on the Estate? They were fun days and nights for sure". You have a lot to look forward to Phil and every day is a treasure . Keep up the great work You guys are on the right track. That's brilliant mate. 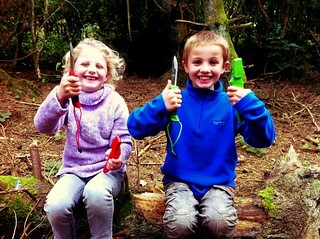 Smashing write up and superb pictures of the young 'uns clearly enjoying themselves out in the wilds. Thanks for sharing your adventures! This is just great, man! Aside from the early stimulation on their young minds, and the bushcraft skills the kids are learning from you, the best part of it is the strong, durable bond you are building between yourselves. I can tell you this is something your children will never forget, and will treasure forever. Many, many years from now, they will look back, and remember, and tell their kids "My father taught me this", and "We used to walk these forests with my father". And your memory will live forever in their hearts. I use to think there were only two true religions in the world. They were Mountaineering and Surfing. I was wrong. There are three. Mountaineering, Surfing and Bushcraft. You combine the ethics underlying these endeavors with the ten commandments and you are on the right path. What you are doing is amazing. Keep it up. And remember if wilderness survives, we survive. Good on yer Phil. How are kids supposed to learn unless someone takes the time and effort to show them the ways? Respect is something gained with knowledge and its great to see your kids enjoying both.